For me, magic was all about the handwaving. Unsurprisingly, I spent a lot of time as the DM. Plenty of stories involved an evil priest or foul wizard, or even the clever ogre mage preparing some terrible ritual spell which would unleash a demon or open a portal into the outer planes. My villains were never big on sustainable dark empires, what can I say? I tinkered with spellpoints, gobbled up articles in Dragon magazine on magical colleges or spell design. But nothing talked about those classic scenes my players (fortunately) never got tired of foiling—the enigmatic, big ceremonial magic with the potential for horrible consequences if the heroes interrupted the casting. For me, though, the frustrating part remained the fact that, while I had mechanics for the efficacy of polearms against chainmail versus leather armor versus plate mail, I was left to my own devices about what magic could do. Things simply worked the way they did because villains needed to do what villains do, and adventurers needed to stop them. That’s the plan—the way of the story. We drew the Great and Powerful Curtain across the details, because, well, weren’t the characters going to succeed? And heck, if they didn’t, then they’d face the demon along with the other baddies. Why did the diabolist need those villagers? Why did the ritual need to be here, in the caldera? We may have written reasons, but they were based on whims, more ornamental than anything. When you came down to it, this was all just a lot of handwaving. Over the years, the handwaving irritated me. I tried some new systems, and learned some new ways to look at magic, and then I found incantations. These grand magical effects took time, needed foci and inflicted backlash. This was the core of what I needed to get rid of the handwaving. So when Wolfgang offered me the chance to work on this for the Deep Magic Kickstarter, I didn’t blink and went straight to crafting the additional bits every villain never knew they needed. I’m quite pleased with the results. Now, you’ve got the tools for ceremonial spaces, for supernatural instruction, for sacrificial magic. Tools that impact the mechanics, so you know what happens when they rescue only two of the seven victims, why that monster is in the fight, and just how difficult it’s going to be for the Bad Guy to open a gate to Hell. And to me, that’s the best part. I get to make the magic more magical, and less handwaving. ENnie-award winning designer Ben McFarland labors in his mystic tower stronghold to the mournful cries of the nearby iron dragon. Lately, his hobbies include scotch, exploring mysterious dreaming realms, crafting bits of clockwork, and exploring magic theory—all with the support of his loving family. His recent works include contributions to Kobold Press’s Midgard Tales for the Pathfinder RPG and Atlas Games’ Antagonists for Ars Magica. Rumors regarding his feelings toward playtest reports are greatly exaggerated. Will deep magic include updated rules from 3.5 for Incantations, or will this just be new Incantations? 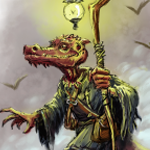 Deep Magic has some small revisions to the Incantation system for Pathfinder RPG published in Zombie Sky Press’ _Incantations in Theory and Practice,_ with a number of additions I found useful. The core of the system is there, as well, for making more. Incantations are very cool, love using and developing them. This alone might sell me on picking up a copy. Rituals make for a fantastic encounter scene, adds a timer and creates urgency which forces risk, which makes the scene more exciting. As one of the villain-foiling players in Ben’s games of yore, goodness knows some of the seeds for this have been germinating for well-nigh two-decades. I’m just curious; will there finally be an incantation to map the sewers? ?